The website addresses are correct - They may not be up yet, however. The first and last meets of the year, (Dunlap, CA and Squaw Pk., UT) will comprise the "US Nationals." Their scores will be combined (with a throw-away option) to determine the US Champion. I hope you find yourselves in the company of loved ones during the holiday season. Dad had been a lumberjack in Washington and Oregon. He had enjoyed being outdoors and had reveled in pitting his strength against the forces of nature. He had entered grueling lumberjack competitions, and had placed often. The shelves in his house were filled with trophies that attested to his prowess. The years marched on relentlessly. The first time he couldn't lift a heavy log, he joked about it; but later that same day I saw him outside alone, straining to lift it. He became irritable whenever anyone teased him about his advancing age, or when he couldn't do something he had done as a younger man. I drove to the animal shelter that afternoon. After I filled out a questionnaire, a uniformed officer led me to the kennels. The odor of disinfectant stung my nostrils as I moved down the row of pens. Each contained five to seven dogs. Long-haired dogs, curly-haired dogs, black dogs, spotted dogs all jumped up, trying to reach me. I studied each one but rejected one after the other for various reasons, too big, too small, too much hair. As I neared the last pen a dog in the shadows of the far corner struggled to his feet, walked to the front of the run and sat down. It was a pointer, one of the dog world's aristocrats. But this was a caricature of the breed. Years had etched his face and muzzle with shades of gray. His hipbones jutted out in lopsided triangles. But it was his eyes that caught and held my attention. Calm and clear, they beheld me unwaveringly. Cheyenne 's unexpected appearance at the animal shelter … his calm acceptance and complete devotion to my father … and the proximity of their deaths. And suddenly I understood. I knew that God had answered my prayers after all. Life is too short for drama & petty things, so laugh hard, love truly and forgive quickly. Live While You Are Alive. Tell the people you love that you love them, at every opportunity. Forgive now those who made you cry. You might not get a second time. Please share this with someone. Ok, this ain't paragliding. . .I had planned to fly the SoCalXC event this weekend in Santa Barbara. I was looking forward to meeting up with the SoCal boys and Nick from Hong Kong, who had flown his Cathay 777 trip to LAX and had enough time to fly. Unfortunately the Santa Ana winds are blowing. We wouldn't be flying anyway, since the tragic "Tea Fire" is burning out of control in Montecito. 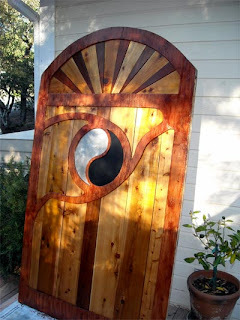 So, I finished up the Gate Project(s) . . . 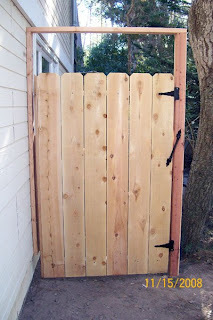 But my Wife decided the new gate was too nice to hide on that side of the house so I installed it on the other side of the house - by the garage and nearer the street with good exposure. 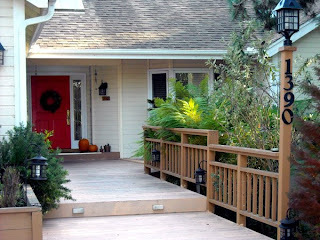 Here's a shot with the gate open looking down the side of the house. Which left me needing another gate for the hidden side of the house. 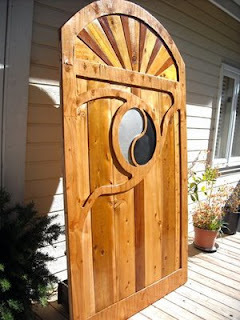 I'd already taken many days to put the finish on the fancy gate so I built what I call a "one-day gate." 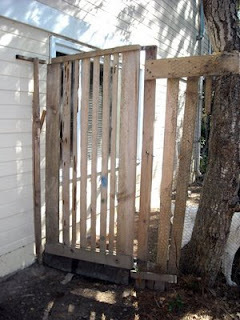 I spent an hour or so digging a post hole, another 30 minutes tying the post to the house for stability (my preferred method since the gates hang true forever) and 90 minutes to built the gate, hang it, and install all the hardware. Damn, I hope we get to fly soon! More time spent not flying this week. I'm playing with the idea of putting the gate in front of the house. . . Here's a Photoshop mock-up of what I have in mind. 'Not sure I like it. 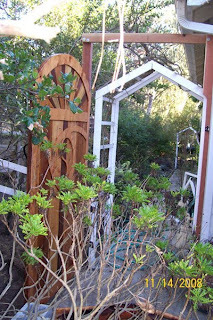 . .
is a gate on the side of my yard that was built before we bought the house, 4 years ago. 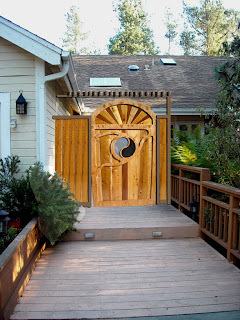 It was obviously built as a temporary gate and it was logged in my brain as "the first thing I'm going to do after escrow closes." Well, after almost 5 years, new floors, a remodeled kitchen, and various other projects, I finally turned to this project. 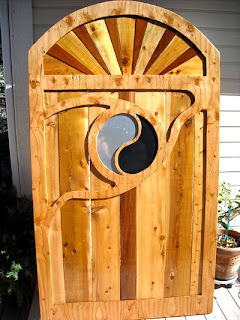 The gate is built-up design with 1/2" CDX plywood sandwiching 1X ceder and redwood stock. 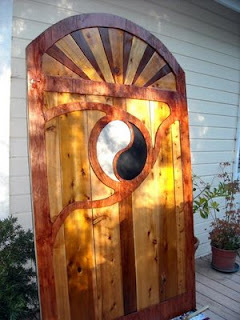 I coated the gate with many layers of a polyurethane spar coating. At this point all I need to do is figure out how to properly protect the edges of the gate from water and I'm going to use a darker finish on the ply outer layer to "pop" the design a bit more from the internal exposed planks. The last two photos show the result of mixing a little oil based stain (dark mahogany) with my spar polyurethane to 'Pop' the frame a bit. 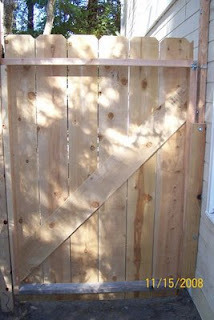 The problem now is that my wife & neighbors think the gate is too nice to hide over on the side of the house. 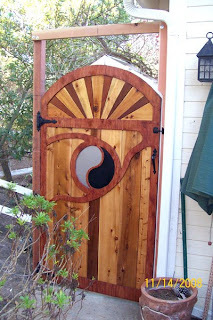 I may install the gate on the other side of the house or even use the gate in a front courtyard that I've been playing around with in my head.